I love coffee. To me, the nicest way to start the day is with a hot cup of freshly made coffee with milk. And I love the occasional coffee out. A properly made cappuccino or latte is a treat that I especially enjoy. There are so many options when you go to a coffee shop. You could order the normal drip coffee, espresso drink, blended coffee, or a variety of tea drinks. But have you ever looked at the nutrition information in the coffee drinks? Depending on where you live, some coffee shops will list the calories in a beverage on the menu, but that doesn’t tell you the ingredients or break out the amount of added sugar in a drink. And if you have been reading my articles for a while now, you know that the ingredients in our foods matter as does the amount of added sugar we consume. How much added sugar is in a coffee drink? How wise is a coffee? There are three main areas to consider: (1) added sugar content, (2) caffeine content, and (3) ingredients other than coffee, milk and sugar. Similar to when we evaluated the added sugar in flavored yogurts, we need to calculate the total added sugar in the coffee beverages. This is because added sugar does not have to be called out on the Nutrition Facts of a product (this changes next year!) and the labeled sugar in the drinks include both lactose from milk and added sugars. Assumptions made during the calculation include that all beverages were 16-oz, made with 2% milk, and ordered without optional whipped cream. The quantity of milk used in the calculation is as follows: Latte (12-oz), Mocha (12-oz), Frappuccino® (8-oz), brewed coffee (3-oz). Please note: there are 4 grams of added sugar in a teaspoon of sugar or sugar packet. Below is a table highlighting the natural (lactose) and added sugar in various coffee drinks. As is probably expected, black brewed coffee or coffee containing only milk has no added sugar. A plain latte also contains no added sugar, though the amount of milk is understandably higher than a brewed coffee with milk. Lattes and mochas differed only in the types of additions they contained (flavor syrups and / or chocolate syrup). Frappuccinos® are the surprising result here containing less milk than a traditional espresso drink but substantially more added sugar. 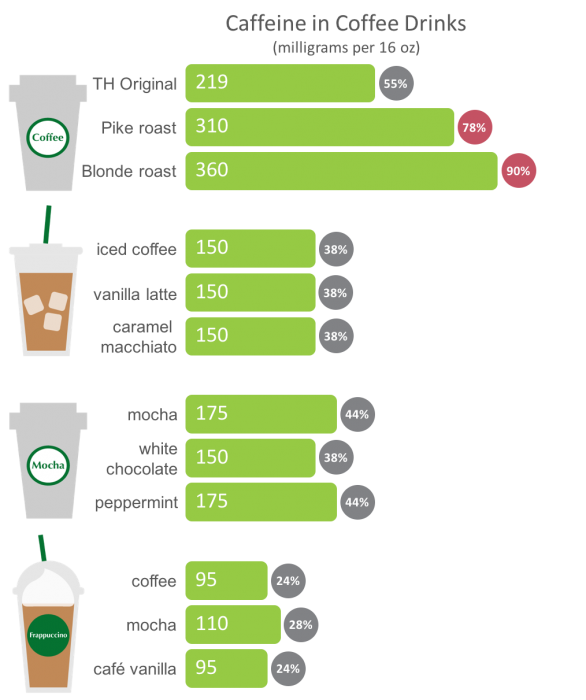 To better visualize just how much added sugar these coffee drinks contain, the below graphic contains only the added sugar, expressed in sugar packets, of a single 16-oz coffee drink. At the bottom of the graphic is the percentage one drink contributes to the AHA’s daily recommended intake of added sugar for men and women. Percentage below coffee name indicates % of AHA’s daily recommended added sugar intake. 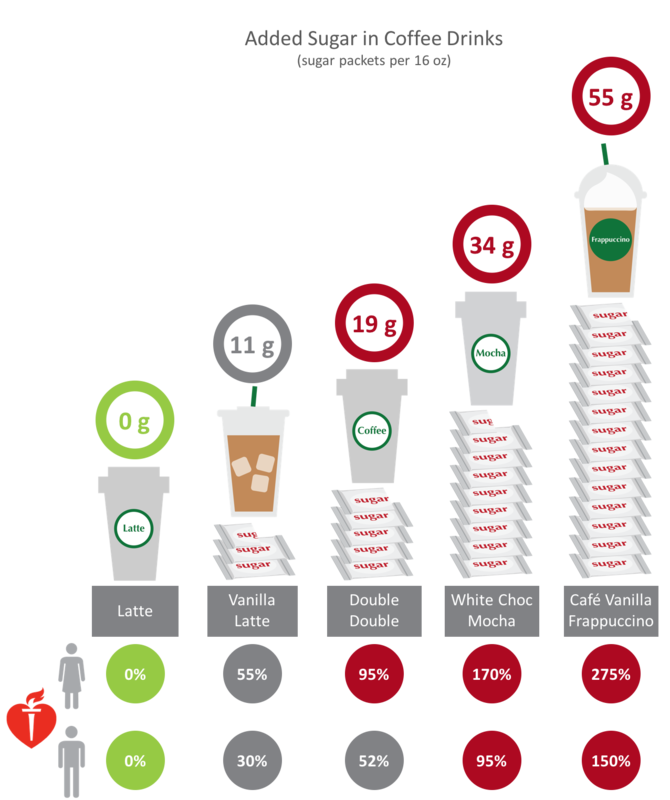 Numbers in red indicate that the coffee drink meets or exceeds the daily recommended added sugar intake. 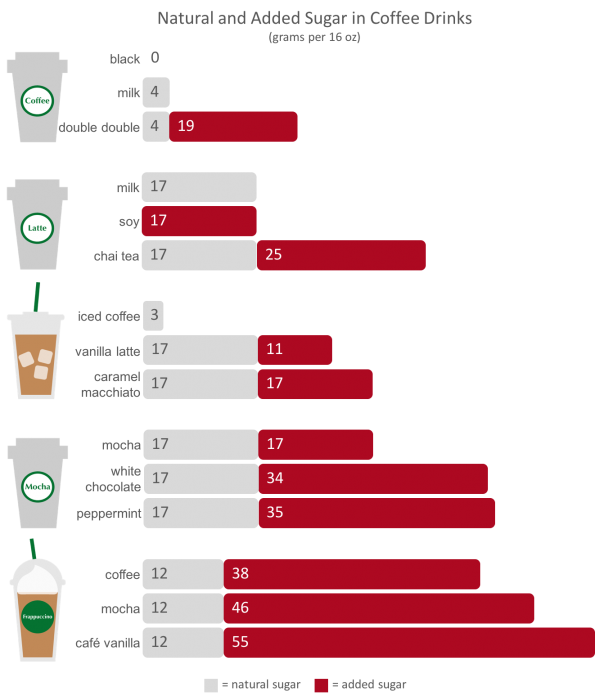 Reported caffeine content of coffee drinks.1,3 Percentage after bar indicates coffee beverage’s contribution to daily recommended maximum caffeine intake.6 Percentages in red indicate increasing drink size or consuming more than one could result in excess caffeine intake. Instead of ordering a pre-sweetened coffee, consider ordering a plain coffee and adding your own sugar. One or even two packets of sugar can be added to coffee while still maintaining a healthy lifestyle. Finally, Frappuccinos® are not coffee. They are caffeine containing milkshakes that contain two to three times the AHA’s recommended daily intake of added sugar for an adult woman. Avoid them or consider them as the truly occasional treat that they are. We are routinely eating and drinking too much added sugar, and it is negatively affecting our health. Update: For anyone wondering, the Unicorn Frappuccino contains the same amount of added sugar as a Vanilla Bean Creame Frappuccino: approximately 43 grams for a 16-oz serving (this assumes 12 grams of the “sugar” listed on the nutrition facts is from 8-oz of 2% milk).